Since finding out I was expecting I've been addicted to mom blogs. First, finding out tons of little do's and don'ts and things to maintain sanity! Also seeing how different mom's maintain a sense of self while raising little ones - hoping I can figure out my balance! Well, while following mommy blogs I stumbled across an opportunity to co-host! Hurray :). Follow along, link up and enjoy! with us and meet new friends? New follower via "Bloglovin, Facebook, Twitter and Pinterest. Thank you for co-hosting ! Thanks for co-hosting enjoy motherhood. 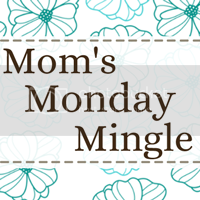 Hi, I'm Deanna your co host for the week at Mom's Monday Mingle. I'm following your through twitter, facebook, and bloglovin. I'm looking forward to getting to know you. I'd love for you to stop by Gloriously Made (http://gloriouslymade.blogspot.com) sometime and check out my blog. Have a great day. Thanks for giving the nice information about shoutcast server hosting. radio streaming hosting. Thanks for sharing. I am agree with your article Shoutcast hosting. is a good idea to increase the performance of website.